Item: CVA 265-48 - At 6:00 a.m. the catwalk cables (from one tower only) were secured. Exactly 6 months later the last of the 8 catwalk cables was taken down. 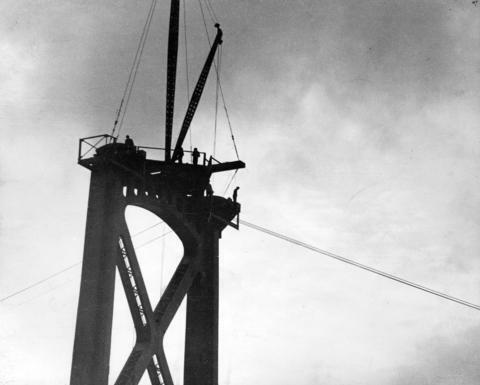 Item : CVA 265-47 - 5:23 a.m. Three of the eight-ton cables for catwalks have been raised 325 feet above tide mark. Distance between piers is 1550 feet.